Netwrix Auditor for Office 365 provides actionable intelligence about what’s going on in your Office 365 environment. Monitor user activity in SharePoint Online and audit all modifications and non-owner mailbox access events in Exchange Online to enhance security and streamline IT compliance. Delivers deep insight into configuration, security and permission changes across your Exchange Online, OneDrive for Business and SharePoint Online systems, including actionable who, what, when and where details and before and after values. Reports on who accessed your SharePoint Online sites or downloaded documents from them, as well as who synchronized files in OneDrive for Business, so you can spot any unauthorized access to your sensitive data. Monitors every change to SharePoint Online sites, lists and documents and OneDrive for Business data (such as list renames, site removals and file updates) to help you detect suspicious user activity and prevent data loss. Empowers you to secure your data and prevent downtime by alerting you to activity that needs your immediate attention, such as changes to your mail server security configuration or SharePoint Online sharing settings. Detects non-owner access to Exchange Online mailboxes and notifies owners about all mailbox activities. Mailbox auditing reports specify exactly what actions were performed on specific mailbox items, as well as the source client and IP address, so you can hold individuals accountable for their actions. Augments Office 365 audit logs by delivering actionable predefined reports and dashboards with filtering and sorting capabilities. You can export this information to various formats, such as a .pdf or .csv file. And you can use the subscription feature to get the reports that are important for your admin audit duties automatically by email. Slashes time spent preparing for compliance audits with predefined reports mapped to PCI DSS, HIPAA, GDPR, SOX, GLBA, FISMA/NIST, CJIS and other common regulatory standards. Enables you to quickly sort through your audit trail and fine-tune your search criteria until you find the information you need. Save your searches as custom reports; you can run them on demand or have the results delivered to you automatically on schedule. Identifies high-risk user accounts by aggregating their anomalous activity across your Office 365 environment and your other cloud-based and on-premises systems. Are you tired of crawling through endless audit logs in the Office 365 Admin Center, and switching back and forth between the Office 365 Security and Compliance Center and the Exchange Admin Center? Do you want to slash the time you have to spend preparing for compliance audits? Do you want a unified auditing platform that will securely retain logs from your SharePoint, Azure AD and other systems? Netwrix Auditor addresses all these needs. It’s easy to get overwhelmed trying to monitor user activities by looking through hundreds of pages with millions of records in the Office 365 Admin Center. Netwrix Auditor helps you identify high-risk users on the prowl by consolidating all their anomalous Office 365 activities, such as the deletion of sensitive files from OneDrive for Business or unapproved changes to site collection sharing policies. 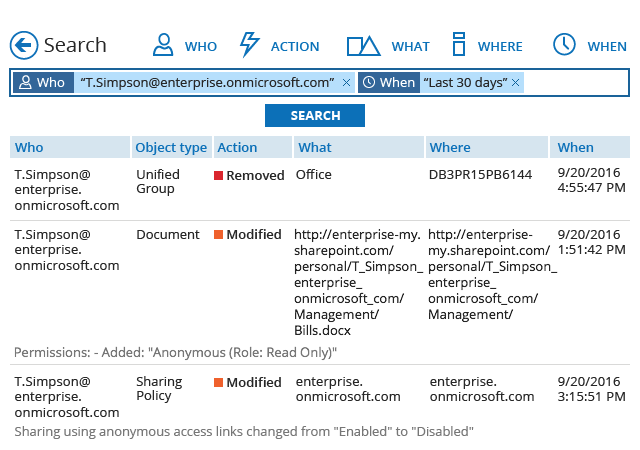 Use the actionable intelligence from Netwrix Auditor to examine suspicious user and admin activity around your SharePoint data or verify unauthorized changes made to Exchange Online mailbox permissions. Drill down into each sequence of suspicious events to discover how the whole attack unfolded, and use this information to prevent similar incidents from occurring in the future. When a user can’t find a critical SharePoint document or a manager says mail has gone missing, you need to fix the issue quickly. You don’t have to switch though endless Office 365 audit reports and Power Bi dashboards or do log searches in eDiscovery anymore. Simply type your query in Netwrix Auditor’s Google-like search and immediately get detailed results that help you quickly resolve users’ problems. Compliance auditors often ask for specific details that might not be included in Office 365 audit log reports. You don’t have to spend days creating custom reports or writing PowerShell scripts to satisfy these requests. 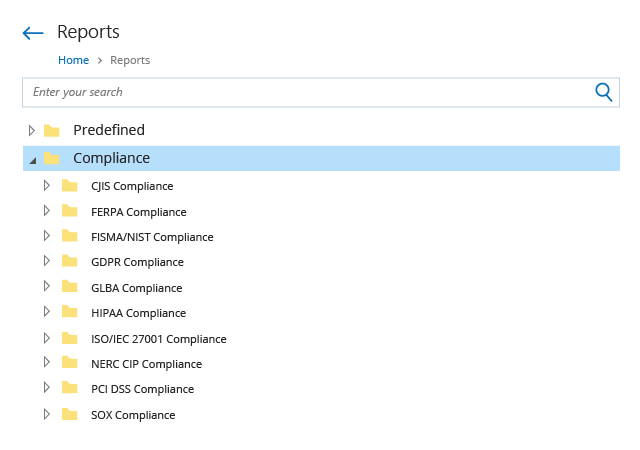 Simply use the Netwrix Auditor compliance reports mapped to specific controls of PCI DSS, HIPAA, GDPR and other compliance regulations to easily prove that your Office 365 environment meets compliance and security standards. Read how Netwrix Auditor for Office 365 provides visibility into your Office 365 environment, helping you detect malicious activity and improve IT security. 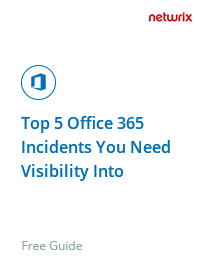 Discover the top 5 Office 365 incidents you need complete visibility into, and how you can get that insight with Netwrix Auditor’s security intelligence. ADEKA Singapore enforces its security policy and ensures business continuity with Netwrix Auditor’s security intelligence. With Netwrix Auditor, Slovenia’s Ministry of Higher Education can quickly find who has changed what across its IT infrastructure. Using Netwrix Auditor, the host hospital for A&E’s “24 Hours” secures its 10,000-user network and ensures its availability. Costain uses Netwrix Auditor to make sure that the IT teams have the proper access rights, which helps ensure IT security. "To be compliant with regulatory standards, we are required to prove that we are in full control of our IT environment. Netwrix Auditor makes audits so much easier. We save weeks’ worth of time! Now we know about every change and every user action in our IT environment, so we also know our data is more secure than before. It’s a great product. I definitely recommend it." The strategic benefits of cloud-based operations are well known and include cost cutting, better ROI, greater application performance and hardware availability, scalability, and ease of management. However, both SMBs and large organizations face vital security dilemmas. Netwrix Auditor for Office 365 helps IT departments mitigate Office 365 email security concerns effectively by detecting and reporting on non-owner mailbox access and Exchange Online security changes in a timely manner. Stable email service is critical to business continuity. Mistakes by administrators or deliberate misdeeds by abusers in your cloud-based Exchange environment can cause email outages or expose sensitive information to unauthorized use. Netwrix Auditor for Office 365 enables control over critical Exchange Online changes and non-owner mailbox access attempts. You can quickly detect unauthorized changes and Office 365 users trying to open another mailbox, so you can take action before these events cause email outages or security breaches. Continuous auditing of Exchange Online configuration changes and non-owner mailbox access is a crucial practice that helps organizations improve Office 365 data protection. Scheduled and on-demand audit reports offer flexible filtering, sorting, exporting and subscription options, enabling you to easily provide stakeholders with clear details about possible data privacy violations. Equating compliance with security is a good mindset in the struggle to prevent data breaches, both on premises and in the cloud. Many contemporary regulations, including the ones that cover Office 365 compliance, are aimed at addressing new cyber security challenges and provide valuable frameworks for improving the privacy of proprietary data. 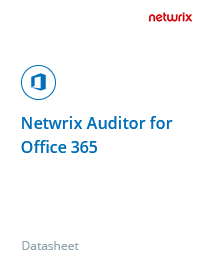 Netwrix Auditor for Office 365 offers predefined compliance reports — along with interactive data search and reliable long-term storage of the audit trail — to help you validate your security controls and make your Office 365 compliant with CJIS, FERPA, FISMA/NIST, GDPR, GLBA, HIPAA, ISO/IEC 27001, PCI DSS, SOX and other regulatory standards. The security and privacy of sensitive data are top concerns for organizations that are considering moving part of their on-premises operations to the cloud. Ensuring the integrity of data is equally important for maintaining regulatory compliance. Netwrix Auditor for Office 365 helps organizations reduce Office 365 security risks and protect sensitive data at rest by tracking modifications to Exchange Online management roles, groups, public folders, mailbox policies, mailbox permissions, mail users and more. To ensure uninterrupted email services in your cloud-based Exchange and prevent exposure of sensitive content, you need transparency into all activity that occurs there. With the right Exchange Online reporting tool, you can quickly spot suspicious actions and get all the details you need to investigate and remediate issues faster. Netwrix Auditor for Office 365 delivers complete visibility into Exchange Online by providing detailed reports on all changes, including who created, deleted or modified which objects, and when and where each change happened. Plus, the application enables you to stay on top of user access to another user’s mailbox or a shared mailbox. Is streamlining Office 365 HIPAA compliance, or compliance with any other regulatory standard, critical for your organization? Equating compliance with security is a smart mindset to establish in order to protect your sensitive data in the cloud. However, providing evidence at audit checks that your corporate security policies completely align with regulatory requirements can be a nightmare, because manually putting together the necessary reports and searching for the information auditors require is time-consuming and stressful. Is there a way to simplify your compliance processes and finally get a good night’s sleep again? Are you worried you might miss critical changes that could put your SharePoint Online data at risk? To shield your sensitive assets better, you need to audit SharePoint Online activity. With ready-to-use SharePoint Online reports at your fingertips, you can be sure that you will be the first one to know about changes to your sites, configuration and permissions, as well as any unauthorized read access, so you can quickly block threats, ensure 24/7 system availability and pass compliance checks. When your organization relies on SharePoint Online to store its data, any admin activities performed in error or without proper authorization can wreak havoc, resulting in system unavailability, data breaches, and major security and compliance failures. To minimize this risk, you need to properly configure your audit settings to stay on top of suspicious changes and access events that would otherwise go unnoticed. To view audit log reports, you can choose the hard way and use Site Collection Administration capabilities. Or you choose the simple path and allow Netwrix Auditor for Office 365 to take care of it. 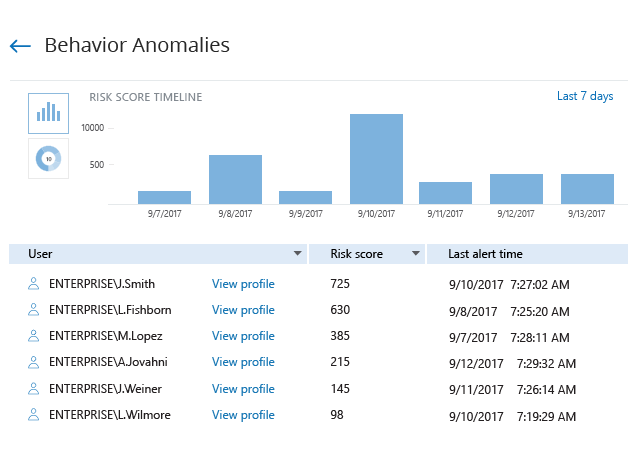 With Netwrix Auditor, you get actionable security intelligence enriched with insights, including all details about the SharePoint Online audit log, so you can quickly identify abnormal actions and respond before they cause real damage. To ensure security and compliance for your hosted email service, you need to maintain control over changes performed by administrators and non-owner mailbox access. You can achieve this goal with continuous Exchange Online auditing that includes monitoring of administrative actions and mailbox auditing. However, enabling continuous auditing with native Office 365 auditing reports or the native audit log can be challenging. Netwrix Auditor for Office 365 streamlines the auditing process and ensures that you have steady control over changes and access events in your cloud infrastructure. OneDrive for Business has been widely adopted by organizations that need a way for employees to store business-related files, access them at any time from anywhere, and share them with other employees. As a result, it often contains business-critical data that needs to be secured. With OneDrive for Business auditing and reporting, you can tighten control over user and admin activities and ensure security and data integrity. OneDrive for Business is a part of the Office 365 suite, which also includes SharePoint Online, Azure Active Directory and other hosted services. Its activity record is stored in the native audit log, which is available in the Office 365 management console. However, native auditing and reporting has important limitations that can hinder your security initiatives. Netwrix Auditor for Office 365 is a comprehensive solution that helps you tighten control over changes and access to data stored in OneDrive for Business. Whenever you need to track user activity, you can do it using the Office 365 audit log. However, the log has a number of limitations you have to keep in mind. For example, its filtering options are limited and might not let you efficiently address your questions. There are some predefined audit log reports on Office 365 activity, but you can’t subscribe to them; if you need to present the data you find to auditors or management, you have to manually export it to Excel. These are just a couple of limitations that you can overcome with Netwrix Auditor for Office 365. When someone adds, removes or modifies mailbox or shared mailbox permissions in Office 365, you need to be the first one to know about it so you can immediately revert unauthorized changes. You can monitor Office 365 mailbox permissions using built-in tools. However, be ready to spend significant time in the audit search, adjusting the filters until you find the information you need. 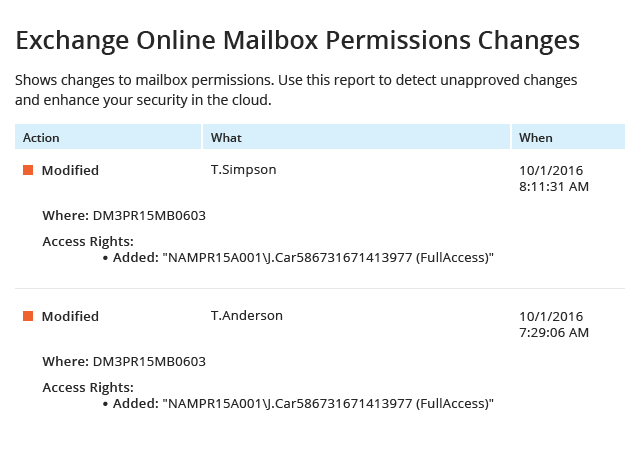 With Netwrix Auditor for Office 365, you can track mailbox permission changes much faster by running a ready-to-use report. Subscribe to the report if you want to have this information delivered to you on schedule, so you can always be on top of mailbox permissions changes. For security and compliance purposes, you might be required to store Office 365 login history far longer than native Office 365 tools can. With Netwrix Auditor for Azure AD, you can track your Office 365 login history for months and store your audit trail in a two-tiered, cost-effective storage for more than 10 years.